Spiral Hosting are today warning our clients to lookout for new scam emails which are linked to recent data breaches at some leading retail websites. 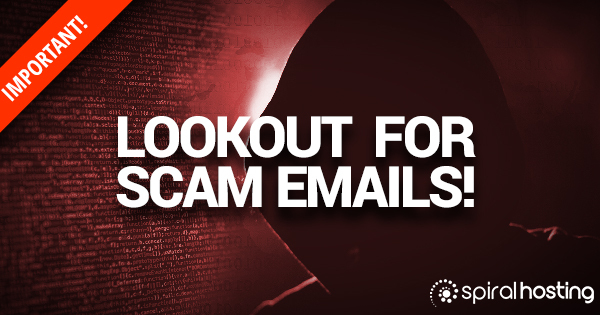 We wish to advise all our clients to be on the lookout for new types of email scams. There are several different versions of a phishing scam email currently circulating, supposedly sent by an “international hacking group”, claiming to have private information belonging to you (for example private messages, photos from your phone, a webcam video). The emails are blackmailing the recipient and threatening to release private information to friends/family if money/bitcoin is not paid. We strongly advise all clients to disregard such emails, consider reporting the email to local police (ActionFraud in the UK, Garda GNECB in Ireland), otherwise just delete the message, do NOT reply to it, and definitely do NOT make any payment to these scammers. The latest scam email includes text like: “You still do not believe it? So, this is your password:”, and it might be an actual password used in the past. The reality is that many large companies (TicketMaster, LinkedIn, British Airways, GameStop) have suffered data breaches in the last few years, and hackers have been able to access names and sometimes passwords during these breaches. Their intention is to scare you, or make you feel guilty, so you will send blackmail money to them. Do not be fooled! – Do NOT pay any money/bitcoin to the scammer! Please contact our support team if you are not sure about the legitimacy of any email you receive.